The South Carolina Bluebird Society thinks "inside the box" - the nest box, that is - in championing the songbird that, as Thoreau said, "carries the sky on his back." 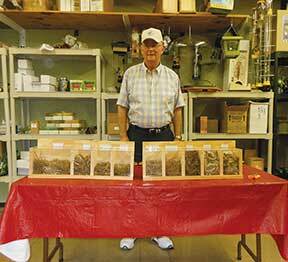 Shortly after Jim and Sharon Burke moved to Aiken in 2007, the couple discovered a well-stocked nature store in town, Birds & Butterflies of Aiken, and early on they participated in one of owner Ron Brenneman's nature seminars. As fate would have it, the subject that evening happened to be bluebirds. When the meeting was over, the Burkes, fascinated with the royal blue songsters, decided to put up their first bluebird nest box. Their new backyard endeavor was soon to launch them as vanguard members of the South Carolina Bluebird Society - but not until Jim Burke had undergone some critical schooling in fostering the cavity-nesting Eastern bluebird. "I did everything wrong the first time," says Burke, "and a snake got the eggs. So I talked to Ron. He told me, ''You need to move the nest box away from the trees and put it on a metal pole.' I did that, and then there were more eggs - and babies! But the babies were gone before it was time for them to go. So I went back to Ron, who inquired if there were any overhanging branches (there were) because 'a big rat snake will just crawl out there and drop down on the box and get the young.' So I started reading everything I could get my hands on about bluebirds so I could do things right from then on." Occasionally, Burke would visit Birds & Butterflies and find Aiken resident Roger Brock talking with Brenneman. 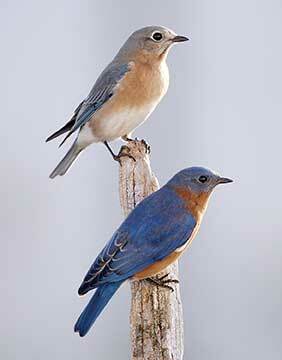 Both men had been part of Aiken Outdoors, which had put up a couple of bluebird trails. They challenged Burke to monitor a bluebird trail - a series of nest boxes on a single property - and began discussing with him the possibility of forming a local affiliate of the North American Bluebird Society. The trio announced a meeting at Birds & Butterflies to see if there was any interest in forming such a group. To their surprise, more than thirty people showed up at that first meeting. Organization and membership growth of the fledgling South Carolina Bluebird Society took off quickly, as did growth in the number of bluebird trails and single nest boxes established and monitored by the SCBS. Burke, currently SCBS president and an NABS board member, speaks of the group's membership with a much-warranted pride. "We've got an amazing group of members," he says. "People just volunteer for anything. I can send out an e-mail or announce a need at our meetings and get a wonderful response. We hosted the 36th Annual NABS Conference in October 2013, and we had more people volunteer to help with it than we had jobs for them to do!" That's pretty slick work for a two-year-old organization, as the SCBS was then. (The national folks said they'd never seen a local affiliate grow so fast.) As a local arm of the NABS, the SCBS is one of fifty-eight affiliate groups throughout the United States, Canada and Bermuda. 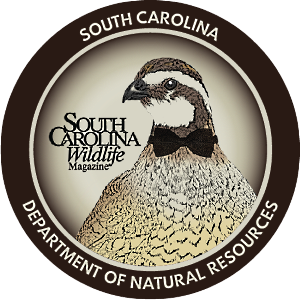 Formed in October 2010 as the first and only affiliate in South Carolina, the SCBS counts 191 members on its roster and has established fifty-one bluebird trails consisting of 532 nest boxes. Their labors in hosting the three-day national conference last October added to SCBS's reputation - not just with out-of-state NABS members, but also with Aiken residents at large. Locals were pleased to welcome close to a hundred out-of-town conference attendees (another sixty or so came from within South Carolina), most of whom stayed at local hotels, ate at local restaurants, shopped the downtown area, visited local attractions, took a trolley tour of the historic district and played golf at local courses. Many also toured natural areas like the Silver Bluff Audubon Center & Sanctuary as conference field trips. The conference was a well-deserved economic boon for Aiken. Similar boosts to local economies like the one spawned by the NABS conference are happening in towns all over South Carolina, as interest and participation in nature-based tourism continues to grow statewide. In Aiken's case, the charm and hospitality on display over the course of the three-day event caused more than one attendee to speak of plans to return for another visit. One of those, current NABS President Sherry Linn of Canada, warmly expressed her impression of Aiken's small-town appeal. "What did I enjoy most about the NABS conference?" mused Linn. "Aiken and its friendly people. It's a beautiful town. I came a few days early, and I stayed a few days after the conference was over. I have to laugh because [SCBS member] Judge Rembert says she's looking at real estate for me! I will be back." But hosting the national conference was just one enterprise on a full SCBS agenda that includes manning educational outreach booths at festivals; speaking at garden clubs, businesses and schools; installing and monitoring bluebird trails and nest boxes; publishing a quarterly newsletter, Nest Box News; training new members; and raising funds to support the organization's ongoing work. "Twice a year, the Aiken Master Gardeners have a big half-day plant sale at the local farmers' market," says Jim Burke. "They've invited us each year to set up a table with handouts and displays like bluebird boxes, nests and feeders - mainly insect feeders, but bluebirds will eat certain kinds of seeds, so we'll have a little bag of those, along with a small container of the live mealworms bluebirds love." 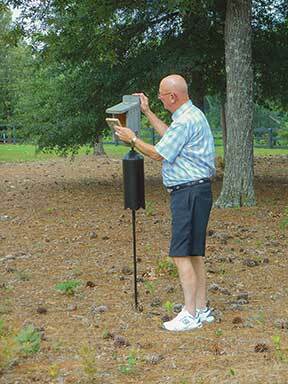 When the group participates in Festival of the Woods at Aiken's Hitchcock Woods, members have even more to do, he adds. "Hitchcock Woods is one of the largest urban forests in the country, with 2,100 acres and seventy miles of trails. The only way you can go in is on horseback, in a carriage pulled by a horse, or on foot. SCBS sets up displays and mans a station on the trail visitors walk. 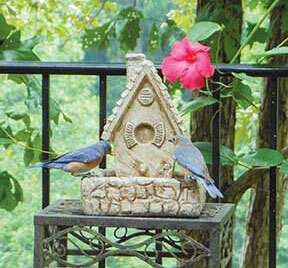 At that station, we'll have a bluebird box and talk to small groups of about twenty at a time about what SCBS does. 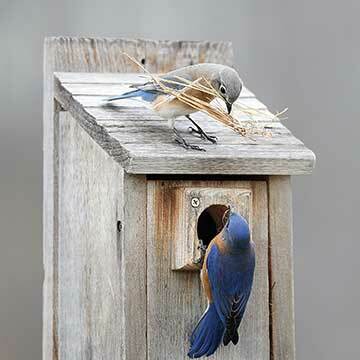 We explain that a bluebird nest box must have certain features - like an inch-and-a-half-diameter hole, vents and drainage in the bottom in case water blows in." Burke also tells them how SCBS members serve as volunteer trail monitors during the breeding season, from March to the middle of August. 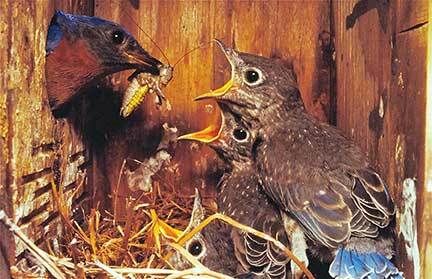 At least once a week, they go out and check every nest box, noting the date and time and what they observed. Is it empty? Has it got a partial nest, a complete nest? Has the nest got eggs in it? Has it got young in it? Monitors keep these records so SCBS knows how many birds successfully fledge. What attracts SCBS members to bluebirds above other birds? Why not cardinals or painted buntings or American goldfinches? Ron Brenneman, who was honored at the national conference for his conservation efforts, feels it's the fact that bluebirds are somewhat used to human beings and don't mind some disturbance. A lot of wildlife you can't get that close to. "Occasionally if we have to," says Brenneman, "we'll gently lift the babies out of the nest box to count them and then put them back in, and it doesn't matter to the birds. We don't touch the birds when we don't have to, but Jim and I both have had times when we've opened a nest box and found the female sitting on the babies or eggs. We've carefully lifted her up, counted what was under her, set her back down and closed the box. Now, that's unusual, but that's how [people] tolerant bluebirds are. Plus they're beautiful and very intelligent, they have a beautiful song, and they're here year round." Another example of bluebird tolerance: When confronted with the problem of orphaned young still in the nest, trail monitors have at times been able to take them out of their birth nest, put them in another box with young of similar age and see them successfully raised and fledged by adoptive parent birds. The SCBS's persistent efforts to bring bluebirds back to downtown Aiken and increase bluebird numbers all over the area have produced several kinds of good fruit. 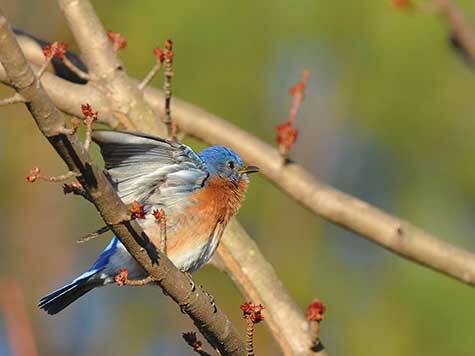 The population of bluebirds in and around Aiken has definitely increased, and, having become more aware of them, more people are enjoying their beauty. Residents from varied backgrounds are working together in SCBS to achieve its goals, kids are getting involved in the work - Burke says the SCBS has enough of them to start a junior affiliate - and more of Aiken's citizens are savoring the outdoors again as they assist in caring for the trails and nest boxes. At Jim Burke's house, the back deck is (of course) a prime spot for observing bluebirds. Seeing to his feeder on a recent sunny afternoon, the SCBS president set out mealworms - filet mignon to bluebirds - and whistled. And the bluebirds flew in almost immediately. Unafraid, they dipped into his largesse as Burke sat back and watched, approvingly quoting fellow NABS member and Missouri Bluebird Society president Steve Garr's cheerful philosophy: "It's a great day to put up a bluebird box!" 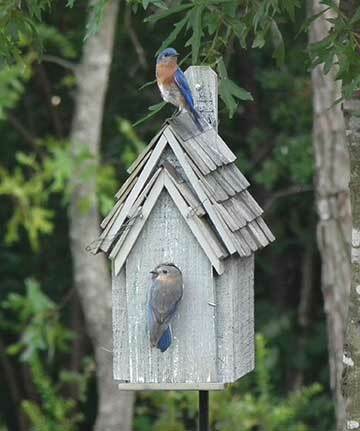 For more information about the South Carolina Bluebird Society, visit www.southcarolinabluebirds.org.